This camera at the TMC Ohio River Biology Field Station in California, KY is the first in what is hoped with be a network of cameras along the Ohio River to detect algal blooms earlier. (from left) Dr. Mike Waters and Dr. Chris Lorentz have a new way of detecting and monitoring algal blooms. They are inside a Thomas More College field station. Using the color of the river, the goal is to detect an algal bloom earlier than traditional methods, which use a microscope. Scientists would also like to find out what causes a bloom to form. In 2015, an Ohio River algal bloom stretched hundreds of miles from West Virginia to Louisville forcing authorities to issue health advisories. This was the same year blooms in Lake Erie forced Toledo to shut down its drinking water supply. 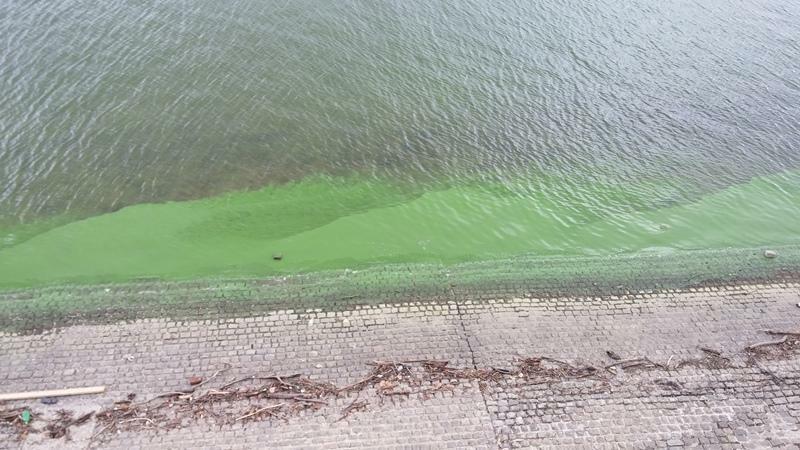 An algal bloom hugs the Ohio River shore in 2015. Algae naturally occur in waterways, but harmful blooms are the product of excessive runoff of nutrients like phosphorus and nitrogen, combined with sunny, warm conditions and low-flow water levels. If people drink algae-contaminated water it can make them sick with gastrointestinal symptoms. Some people have reported breathing problems, along with skin, eye, and throat irritation, after contact with affected waters. The first camera in this Ohio River project is in California, Kentucky at the Thomas More College Biology Field Station. Professor Chris Lorentz has partnered with Mike Waters, an NKU math professor. Lorentz says Waters has revolutionized the method used to detect algal blooms. "So, traditionally, the detection method would involve gathering a water sample, looking at the water under a microscope, counting the cells, trying to detect the toxins, and that is still in vogue today, but what Dr. Waters has brought to the table is the ability to detect harmful algal blooms using a camera and taking photographs." Waters' algorithm uses an artificial neural network. It models the way the brain solves problems. Waters has also developed a citizen scientist app he's testing in Lake Erie. It uses the same algorithm. "The idea is that the application will be released to the public in the next couple of years. They will be able to use that information to help determine whether the water is safe or could have a harmful algal bloom and they should stay out," he says. It will likely be four to five years before there are any concrete results with the river cameras and computer algorithm. Key discoveries made by Cincinnati EPA scientists are helping solve lead contaminated water issues across the country and better predict when harmful algal blooms might threaten drinking water. The toxic green glob of slime known as an algal bloom which spanned over 600 miles on the Ohio River in September, 2015 is gone now but water experts remain vigilant in efforts to control and treat it when it comes back. Tuesday marks the second Algal Toxin Summit in as many years in Cincinnati, bringing together leading experts in water technology, utility water treatment, water quality and monitoring.